Predominantly Indian, Pakistani and Bangladeshi people. Predominantly Chinese, Filipino, Thai, Iranian, South Korean and Afghani people. Seven emirates and one advisory body. 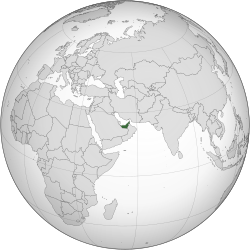 The country's exact size is unknown because of disputed claims to several islands in the Persian Gulf, the lack of precise information on the size of many of these islands and that most of its land boundaries, especially those with Saudi Arabia, remain un-demarcated. ↑ 1.0 1.1 1.2 "United Arab Emirates". CIA World Factbook. ↑ 2.0 2.1 2.2 2.3 2.4 "United Arab Emirates". International Monetary Fund. ↑ "Population (Total)". World Bank. ↑ "2015 Human Development Report" (PDF). United Nations Development Programme. 2015. पहुँचतिथी 14 December 2015.